Stacy Trasancos asked me to review her post “Why Are Catholics Criticizing Dr. Theresa Deisher?“, and in particular the paper “Impact of environmental factors on the prevalence of autistic disorder after 1979” in Journal of Public Health and Epidemiology by Theresa A. Deisher and four others (Trasancos has links to all the material). It is Deisher’s (implied) claim that vaccines created (in part) with stem cells “harvested” from the human beings killed for being inconveniences to their mothers are causing an increase in the rate of autism. Whether it is, or under what circumstances it is, ethical to kill human beings still living inside their mothers. Whether it is ethical to use the tissue from these killed human beings, considering this tissue might lead to more efficacious or cheaper vaccines (which will surely save lives). Whether these vaccines might cause any form of autism. If so, how likely is it to contract some form of autism from these vaccines. Whether it is ethical for Deisher to investigate these claims, given that she might personally benefit (monetarily or spiritually or whatever) from identifying this cause of autism. Whether Deisher is a liar, cheat, or a fraud. Matters (1) and (2) I will not here discuss; they are irrelevant to (3) and (4), which are the subject of Deisher’s paper. Matter (5) is easy: the answer is yes. If it were not, we’d have to fire every scientist everywhere who working for a paycheck, which is to say, all of them. And anyway, claims have to be investigated independent of how they are made. If you rebel at that idea, or automatically dismiss Deisher because of some perceived “red flag”, you are committing the genetic fallacy. Matter (6) we shall come to, but for the lazy among you, I think the answer is no. Whether vaccines created, in part, from cells “harvested” from dead babies possibly causes any form of autism is a question which I am not competent to answer. I have read enough in the literature to have learned that while there is great and consistent suspicion that they cannot, there is no absolute proof that they cannot; further, Deisher does introduce valid evidence that shows these cells can wreak havoc in other body systems, so it remains possible that (at least some forms of) autism are caused by these cells. But, don’t forget, “possible” is an extremely weak hook to hang your hopes on. Deisher’s paper is premised on the supposition that “fetal and retroviral contaminants in childhood vaccines” might cause autism. If my reading was shallow, or if anybody else has certain proof this premise is false, now is the time to say it. Otherwise, we must continue. Now there are many vaccines given to children and at various ages and manufactured by different companies (we are not just thinking of the USA, folks). Even before the vaccine-autism “controversy”, not all kids (in “developed” countries) were vaccinated, though most were. Records on vaccinations are, as far as records go, reasonably good, but not perfect. Records on autism diagnoses, given that there are many forms of autism, are far from perfect, though improving. Kind of. The key word is diagnoses. Long ago, before autism was well understood, it was, of course, not well diagnosed, so that even if records were immaculate, which they were not, we would not have had a good idea of the actual rate of autism. The increasing centralization of medicine, in teaching, practice, literature, and regulation, undoubtedly contributed to an increase in the diagnosis rate of autism (the reader understands I mean the disease in its various forms; we’ll tighten this later). Indeed, a steady increase in autism diagnoses has been observed. And then the disease hit public awareness. And then the disease underwent a broadening in definition, especially in the hugely influential Diagnosis and Statistical Manual and its revisions. And then western society increasingly decided that being and acting male was a disease. And then the media was flooded with “Ask your doctor if Profitozol is right for you” articles and ads. And then the Internet hit and facilitated self-diagnoses. And then some wacky celebrities decided vaccines must be causing autism. The diagnosis rate increased, surely in part because of all these things. But the diagnosis rate could also have increased because something new was causing new cases of autism. How to separate the increase in diagnosis rate from (let us call them) “awareness” factors and actual disease causes? Some thing or things caused each diagnosis, and some thing or things caused each true case of autism. The two sets of causes are different (a doctor identifying a wound is not the wound). Or has the disease definition been expanded so much that even marginal cases are being accurately identified as autism: understand that I mean here accurate diagnoses but for an “autism” that is not be the same “autism” of two decades ago; e.g. every time a boy acts like a boy is now some form of “autism” (or “Aspergers” or whatever). The Diagnosis and Statistical Manual has been changed many times, and various diseases and maladies have not only changed, but their diagnostic criteria have also changed, in general to broaden them (some jokingly say we’re all mentally ill now). New issues of the DSM are released, as Deisher reminds us, at fixed points in time. But that is not the whole story. The changes to the diagnostic criteria are (or were, up until this newest edition) generally and increasingly known before their actual publication date. After all, the DSM attempts to summarize a known literature, and doctors are free to change their behavior in advance of the new DSMs (which isn’t, anyway, legally binding on doctors). Point is this: the appearance of new DSMs is not a hard-and-fast “change point” in physician behavior, though it does represent a change of some kind. And even if the contents of new DSMs were completely unknown to physicians until publication dates, not all physicians rush to the bookstore the day these manuals are issued and immediately and wholly change their diagnostic behavior. It takes time for the changes to be assimilated, for new doctors to be trained to come up through the ranks with the new ideas in their heads, and for the dinosaurs who stick to the old ways to die. And so on. We’re finally back to Deisher, who from her paper does not appear to appreciate these and similar points. I find the paper poor in conception, argument, and quality, and regard her main contention as unproved (which is logically consistent with it is still possibly true). Here’s what she did. She collected statistics of autism diagnoses rates from various localities and in different forms. Sometimes she examines prevalence, other times incidence, and still other times raw counts. This is confusing. The data sources are not well documented, nor are the procedures she used to construct the eventual data used in her analyses. The “data sources” section in her paper is exceptionally thin, and mostly given over to detailing how she discovered publication dates of the DSMs, which is not disputed by anybody. Part of Fig. 1 from Deisher et al., 2014. 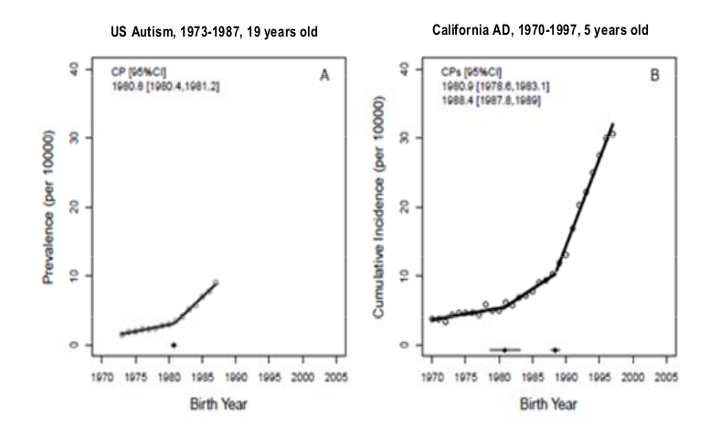 The picture on the left is prevalence of autism for the US in the years indicated, and the right is incidence for California. The black lines are the Deisher’s central “finding.” But don’t look at them yet; instead, look just at the dots on the picture on the left, and suppose these are genuine (like I said, I don’t have complete confidence this data is error free). The diagnosis rate is increasing. Something must be causing this increase in diagnoses. An increase in diagnoses does not necessarily imply an increase in disease presence. The change in “awareness”, as detailed above, is surely a plausible cause in the diagnosis increase. Is it the only cause? Nobody knows. There might be others. Centralization (as discussed above) is one cause. It could be that Deisher’s contention is right and vaccines are contributing to an increase in the disease, which itself is causing an increase in diagnoses, or it could be that global warming is causing a disease increase, or that cosmic rays have been leaking through the atmosphere at increased rates, or it could be anything. Who knows? The broken black line is the result of a statistical model called a “change-point regression”, a procedure which identifies were breaks might have occurred in data. The eye is drawn to this line, making the “break” appear realer than it would if the black line had been absent. Is there really an increase in the increase in 1980.5? Maybe. Are there really two increases in the increases on the figure on the right? Maybe. But maybe not. If you subtract away the lines, the breaks are harder to see. Deisher’s point is that these breaks do not correspond to the DSM releases, and thus that something other than awareness must be causing the increases in diagnoses. The first is that, as discussed above, DSM release dates do not cause instantaneous shifts in physician behavior. And anyway, changes to the DSM were not the only changes to awareness, as we saw. The second is that, even if the change points are real, and even if the other statistics in her paper (which I don’t detail here, as we’ve already gone on too long) are accurate, Deisher has not proved that the cause of the observed changes must be vaccines, especially since the changes in vaccine types were concurrent with changes in awareness. Deisher nowhere measured which vaccines each child received and which child developed autism, which is the only way to demonstrate potential causality. She only (crudely, too) measured various rates of diagnoses. To conclude the changes in these rates must be from the one cause she posited is to commit the epidemiologist fallacy. Deisher herself is at least partly aware she has not proved her case, because she admits “While we do not know the causal mechanism behind these new vaccine contaminants and autistic disorder…” But absent any causal mechanism, there is no case. Obviously, experiments cannot be run on children to see which vaccines might cause which disease. But vastly superior epidemiology can be performed. Specific records on children (including medical history, genetics, etc.) can be kept, tracking when and what kind of vaccines, and so forth. And because this has become a public concern, such things are being done. Amateurs who have spent no time investigating quacks irresponsibly think all quacks are frauds, or that all bad science comes from scientists with evil motives, or that everybody who makes a claim that turns out wrong is only making that claim for nefarious reasons. Bosh. Most quacks are not snake oil salesmen. And most scientists who cherish false beliefs (and I must remind us that we have not proved Deisher’s belief is false) are sincere. The homeopathist who sets up shop and the apocalyptic global warming climatologist who submits a grant do so not just because they want to make a buck, but because they believe they are helping mankind. They are not scamming anybody but themselves. Indeed, the exact opposite is true: these people believe, which is why it is so hard to talk them out of their mistakes. I have seen no evidence that Deisher is a quack or fraud or that she is lying or that she is ignorant. Instead, there is overwhelming evidence that she is highly intelligent and believes what she is saying. True, she does not help herself by showing up at the Autism One conference, which has more than its fair share of homeopathists and chiropractors, but if we condemned scientists who spoke before screwy audiences, we’d have to fire every researcher who ever appeared on television. What Deisher’s harsher critics are doing when calling her a fraud or liar is changing the subject (just as do those critics who call global warming a lie or a scam) away from the claim of true interest—do certain vaccines cause autism?—to those of personalities and politics. The claim is forgotten or dismissed with a wave (“only a fool would believe…”) and people are encouraged to take sides without having to do the hard work of thinking. Update Since it’s come up. What Does The Regression Equation Mean? Causality? and Regression Isn’t What You Think and The Biggest Error In Regression and What Regression Really Is: Part I, II, III. Warning: do not operate heavy machinery while reading these posts. Deisher’s use of change-point regression is certainly not unusual, but I don’t love it here for the long reasons explained in the new links. It can be and is useful in other contexts. Software geeks can think of it as edge-detection for points. There is a very serious problem in looking at autismâ€”that of the diagnostic criteria. When I was in college in the early 70’s, you could spot a child diagnosed with autism immediately. They flapped their hands, they were often nonverbal, they screamed when touched. There was absolutely no way to miss that the child was not like other children. Now, you see happy, smiling children on their way to Disneyworld waving at the camera. They look and act exactly like very other child you’ve seen. There’s the “I have Asperbergers so love me” singer who at one time I considered a lovely singer but now I only see as Asperbergers since that is the way she self-identifies. Autism is virtually a bad of honor now, not a disease. Which, just as a guess, explains the huge number of new cases. And makes actual detection of the cause of what was originally called autism and was debilitating, virtually impossible without very clear criteria for diagnosis. You must compare only the children who are clearly different from everyone else if you use data from the past. No easy task. As a neurologically suspect (borrowed from The World According to Garp’s sexually suspect) person myself and the father of an Asperger (diagnosed) daughter myself, I have a lot that I’d like to say about the subject but just don’t have the time right now. But in the end, I agree that comparing diagnoses today against diagnoses of yesterday is virtually impossible and to blame autism on vaccines is even worse than blaming Climactic Climatic Catastrophe on carbon. If the paper is so weak how did it end up getting published? It seems to me that if Briggs could quickly and effectively make the case that the author hasn’t shown much at all why would this ever get through the peer review? ohn b: Yes, I am certain some people will take offense at how I word things and what I say. I cannot please everyone and have found that trying to is a waste of time. I just say what I believe. It’s much easier and clearer in the long run. If you are offended by it, you can certainly let me know. Say what you think and don’t be timid. I find again that there is an almost immediate supposition that I say what I do because I don’t understand or have any experience with the topic at hand since I’m not compassionate and caring and whatever else applies. You may be surprised to find that I have much more experience with things than people suppose and that first hand experience does not necessarily lead to agreement with others. I am always willing to discuss why I have these views and why I lack the “understanding” that seems to be so demanded in life now. You may be surprised by my reasoning. Part of my concern with the popularization of autism is that children who truly are autistic and non-functioning are left behind as more and more and more behaviours that at one time were simply considered “a bit off” or “being different” are treated as if they were illnesses. There’s only so much time and money available. Yawrate: I think the lack of quality in peer-review has been discussed frequently here. You do know that papers that were completely computer generated made it through peer-review, right? It’s not like peer-review actually improves quality. This is a quite unserious and weak argument that can be applied to almost anything. Autism is caused by space monkeys. I think most people roll their eyes anytime a paper comes out with a potential causal mechanism for autism. Invariably they almost all rely on simple correlation from a scientist with an agenda. The favorite here is usually GMO’s, which also paradoxically also correlates with organic farming, so you get to choose which one is really the cause! Match your agenda. The viewing of television closely correlates with autism along with a bunch of other crazy claims. What Deisherâ€™s harsher critics are doing when calling her a fraud or liar is changing the subject (just as do those critics who call global warming a lie or a scam) away from the claim of true interestâ€”do certain vaccines cause autism?â€”to those of personalities and politics. The claim is forgotten or dismissed with a wave (â€œonly a fool would believeâ€¦â€) and people are encouraged to take sides without having to do the hard work of thinking. I wish. Let us pray our betters don’t decide that it would be oh so much more efficient to sacrifice a few kids to find out. For the greater good and all. The required desensitization for such reasoning has been proceeding apace for decades now. That’s why I put the mildly in parens. I will stand with Sheri with the over-indulgence of autism spectrum disorders that have been batted about recently. It is hard to take this science seriously anymore. I sympathize with any serious scientists out there who are diligently working on this problem. They are in a sea of quacks if you take media exposure as a measurement. Being a geek or nerd used to be a put down 40 years ago. At least half of that group would likely be diagnosed with an autism spectrum disorder today. There is about a 90% my daughter would be diagnosed with Aspergers if I bothered to bring her in for testing. And I know where she got it from, me. I really don’t view many of this set of mental characteristics as a problem, mostly I see it as only being different, versus being a “defect”. In some ways it is advantageous. For example the ability to deeply focus on narrow subjects is useful in academics and certain STEM careers. And for the record, interaction with humans is highly over-rated, ha ha. John B: I’m not sure social awkwardness and shyness is as much of a handicap as deafness or blindness. Again, I go back to the original diagnosis of autism, where a clear handicap was present. Asperbergers is not a clear handicapâ€”in fact, it’s barely noticeable in the vast majority of cases. It’s more like a child with four toes instead of five and you transplant another toe on so the child isn’t different. Looks like we have a lot of volunteers who are abandoning vaccines so we may get the data yet. Read the position from NAD Position Statement on Cochlear Implants (2000) – They’d be totally with you and me! …The focus of the 2000 NAD position statement on cochlear implants is on preserving and promoting the psychosocial integrity of deaf and hard of hearing children and adults. The adverse effects of inflammatory statements about the deaf population of this country must be addressed. Many within the medical profession continue to view deafness essentially as a disability and an abnormality and believe that deaf and hard of hearing individuals need to be â€œfixedâ€ by cochlear implants. This pathological view must be challenged and corrected by greater exposure to and interaction with well-adjusted and successful deaf and hard of hearing individuals…. I’ll leave it to you to read the whole thing and wrap your mind about what it is they’re saying. Now, combine social awkwardness with low intelligence (the child may even be highly intelligent but their ability to “communicate” may be severely diminished – even though they can talk) limits their ability to come to EASY terms with neurotypical society…there’s a spectrum. Tom, I’m happy that you and I and your daughter are probably undiagnosed “High Functioning Autists”, My point was that many Aspies (even lower functioning ones) are proud of their “problem”, don’t want the Medical Field or the Government to “FIX” them. Sheri said: Iâ€™m not sure social awkwardness and shyness is as much of a handicap as deafness…. I think we are on the exact same wavelength, even though we struggle to express it clearly, ha ha. I definitely agree that there is no need for “fixing” high functioning Aspies. Unfortunately it is also correct that other humans like to be communicated with and they don’t usually like to be communicated with as if they were computers. Wife = irrational. This is a communications strategy I have learned not to use. John B: I am aware of the limitations of cochlear implants and that they do not “cure” deafness. Rush Limbaugh has spoken at length about his cochlear implants and how they function, as well as other research I have done on the subject. I have worked with people who are both deaf and hard of hearing. I agree that today’s technology helps immensely–I love closed captioning. I understand the “I am what I am idea”, but that’s not really my argument here (there are groups that advocate being 500 lbs and loving what you areâ€”there is a spectrum to everything and there will always be the end of the bell curve to deal with). It may be Tom’s and I know it is others. My objection to this is the ever-expanding list of “defects” in humans. Understand that “mental illness” is no longer mental. It’s all considered chemical requiring medication to fix. You can’t even grieve past a couple of weeks over a death without falling into the Chemical/Physical disease of depression. This is not saying you’re quirky–it’s saying we are all “sick” and need medication to be fixed. When virtually 100% of your population is “sick” one really needs to rethink what sick means. I don’t believe people are owed coming to EASY terms with society. Some struggle and some don’t. Calling a struggle an illness makes no sense. We can address how to help those who struggle without making them literally sick. Yawrate – because Diesher paid author handling fees to get published in a less-reputable source. This is why it’s so important to check sources with a high impact-factor and not those which are basically banned in other countries. I appreciate your giving Deisher’s data a look over. I do wonder if you read the posts that Stacy Transcanos has criticized as I think you have mischaracterized both their intent and content. Sheri, there’s no such disorder as Asperbergers. Let’s don’t mix up what we’re trying to prove. If one want to examine Deisher’s claims, do so along the lines I did. If one wants to examine Deisher herself premised on the belief that Deisher took a (let us say) relaxed posture with respect to the evidence, and thus one wonders why, then talking about her organization, past activities, and all that are fair game. But we can’t start there. We must first examine thoroughly her claims. Nobody bats 1.000. Though I think my comments are fair. You do see I was mentioning her harsher critics and then speaking not just of the “Deisher affair”, but more generally? Besides, one of the terms Stacy told me used about Deisher (going by memory) was “thermonuclear stupid”. And a post I saw somewhere spoke more than once about a “lie,” another about “red flags”, etc. (this was on more than one site; but I’m not interested in arguing about who said what to whom and when). This reminds me. I’ll have to look up and repost the experiments I co-designed to test Korean kids for (something like) ESP. Ran by a doctor who was a True Believer, associated with an organization that I’d guess was not as faithful. Wait: for once I wasn’t lazy. Here’s the link: The MIT Dahn Yoga Brain Respiration Experiment: Part I. First, short descriptions of the important points. The authors identify important change points in time (Year) and describe what happened in each of those years. They also perform some correlation analysis and state the following as one of the consequences of this paper. Between year 1992 through birth year 1998, there are sufficient number of children vaccinated or not vaccinated with Varivax (chickenpox), whose data is maintained in VSD, that could be used to determine the relative risk of an autistic disorder diagnosis for those who did or did not receive this heavily contaminated fetal cell manufactured vaccine. This overlooked potential trigger for the worldwide autism disorder epidemic demands additional studies in order to assure the safe manufacture of routine recommended childhood vaccines, particularly since reverting to animal based manufacturing methods. Is it weird that I’m watching a rerun of Psych while reading this? Is it destiny maybe? It does get a bit confusing watching and reading Brigg’s link at the same time, but it’s the era of multitasking! My opinion on the statistical analysis. The graphs showed in this post plot prevalence and cumulative incident versus Birth Year. The curves are going upward due to the cumulative characteristic. The rates seem higher (steeper line) for the last few years plotted in the graphs. The controversial graphs are the two titled Varraix immunizations (VI) plotted against Autism disorder (AD) cases from 8 years old for birth 1993 â€“ 1998 and Hep A immunization cases (HI) and AD cases for 3 years old children born between 2003-2008â€ in Figure 3. They use the total absolute numbers (from 1993 to 1998) for both VI and AD, and analyze the relation between VI and AD. Perhaps, they should use the number of cases per 10,000 or 100,000 people . I would suggest that they adjust for the effect of the number of observed children. Furthermore, the possible effect due to â€œYearâ€ should also be accounted for; especially it is evident that the numbers of VI and AD do increase with time. Remember, correlation doesn’t imply causation. Without data, I cannot fairly judge whether their claims are valid. However, the statistical analysis need a make over! It wasn’t a question directed at me, so I could have left it alone, but I had heard that question a lot from Diesher supporters, basically claiming that since it was published, no one else should look critically at it. Jcali: It’s a version of appeal to authority. If a professional journal published it, it must be valid because professional journals are peer-reviewed and therefore have authority. Sheri, do you really think that neurologists, psychiatrists, psychologists, etc are making up a condition that doesn’t exist? Autism exists on a spectrum, and always has. Kind of like bacteria and viruses existed before they were seen or understood. In fact our knowledge of…well basically everything in the universe is constantly growing and changing. Just because YOU don’t understand autism spectrum disorder doesn’t mean it doesn’t exist. Sheri & Tom Sharf: regarding â€œObviously, experiments cannot be run on children to see which vaccines might cause which disease.â€ – I read that not as voluntary testing, but rather more along the line of mad scientists experimenting. I’m probably tainted by what I’m now reading: Mike Flynn’s excellent Wreck of the River of Stars, wherein one character was rescued from a lab where she was one of a set of clones produced to test some theory or other – all here fellow clones ended up as “laboratory waste”. To sum up: Testing – Good. Experimenting – Bad. Sheri – I agree. I was just pointing out the flaw in awarding “authority” status to a publication that has been labeled “predatory” and has a low impact factor. We need to know whom we trust, if we choose to follow the “trust authority” framework rather than looking critically at the science, as this article does. Marian: In a word, yes. And again, the assumption that I don’t understand the autism spectrum disorder because I see that the term “mental illness” is free to be whatever subjective criteria one want to attach to it, with no objective measures. The argument “you don’t agree with me so obviously you don’t understand” is not a valid argument, though I have noticed it seems to be emotionally satisfying to the user. The argument that “we didn’t know what bacteria were either” is meaningless, also. (Remember, one of the original persons who thought not washing one’s hand after autopsies, Semmelweis, was thrown in a mental institute for voicing the idea.) Arguing that we “may discover something” is what pseudoscience does–we may one day prove homeopathy is right and water has a memory. We can’t prove UFO’s are alien visitors, but someday we might. These arguments means nothing until the proof arrives. Sheri, autism is not a mental illness and there is an objective test for it. There are also many genes linked to it, and there are measurable differences in the brains of autistic people. I don’t know where you’re getting your ideas from. I tend to agree with Sheri. When you look up autism, the symptoms have a very wide range (almost a catch-all) the lowest of which could be summed up as doesn’t get along well with others. There doesn’t seem to be an objective definition so how could there be an objective test? A list of symptoms is not a test for an illness. Symptoms are what go with the disease, NOT the disease, except in mental illness where symptoms are the ONLY things that are there. Many are voted into existence and voted out, as was the case with homosexuality and for a brief period, pedophilia. The DSM is a list of symptoms, not a diagnostic test. It is 100% subjective, and any illness can be removed at any time or the criteria changed. Try doing that with say ebola–vote it out as an illness. Not the same at all. Brain scans are also subjective. Double blind tests will reveal that interpreting brain scans is about as accurate as tree-ring proxy interpretation in climate science. Ink blots were once the standard for diagnosing mental illness. There is a reason it’s called “mental illness”â€”there is no physical test or known cause for the condition. As noted, one person who dared to intimate that delivering babies after doing autopsies might increase illness in babies and mothers was sent to an assylum. Mentally off, he was, was he not? Note to all the angry people right now who are seething that I “just don’t understand”. I am not saying that people do not have difficulty in life, don’t lack skills sometimes to deal with life and we should just let them flounder. I am saying that blaming everything on illness takes away the power of the individual to be taught to help themselves. It encourages society to want everyone to be the same and to medicate the society into compliance. We should never leave people out in the cold struggling to deal with life. But drugging them into apathy is really my idea of kindness. All medications have side effects and some have long-term damage that cannot be reversed. When we get into the “psychoses” (another term that has changed dramatically), there currently are not therapies to help in many cases and drugs are the only option. However, the number of psychotic illness is tiny compared to all the “illnesses” in the DSM so I am saying that a huge percentage of people would be better served being helped in dealing with life instead of being told they’re sick. For clarification, the term “thermonuclear stupid” came from the nome de plume of Dr. Gorski, MD, PhD, a breast cancer research scientist, regarding Deisher’s claims that fragmented, trace, cell-free DNA from vaccines could cause genomic insertion that would trigger autism. You might disagree with his style, but he is hardly unqualified to comment on the biological (im)plausibility! The problem is autism has a negative stigma attached to it. The lesser ends of the autism spectrum are better termed conditions or characteristics in my opinion. Joe Public will think anyone who was diagnosed on the autism spectrum to be mentally ill. No way he is letting his kids play with that autism kid. Agreed, Tom, which is why I object to calling behaviours illnesses. The young man appears to have Down’s Syndrome but is identified as “autistic spectrum disorder”. It seems many things have migrated into the autism diagnoses or maybe the news people just see a guy that’s a bit different and slap the label on. Who knows? Certainly would indicate that actually finding the cause of autism won’t be easy since so many things now wear the label.